Delta, United, JetBlue snack boxes: Airplane food is actually getting better. 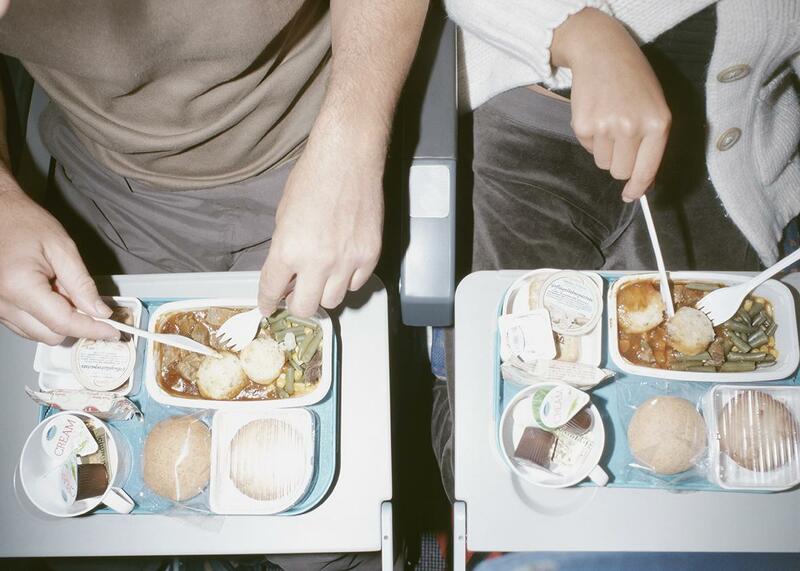 How Did Airplane Food Get So Good? We can thank customer feedback and the early-aughts recession. This is not your only option anymore. By all accounts, flying is a more miserable experience than ever. Fares and delays have increased, legroom has decreased, things that used to be free—checked bags, movies, early boarding—are no longer free, and TSA’s security procedures are a demeaning farce. There’s one part of flying, however that’s actually gotten better in recent years: the food. I’m not talking about the chef-created sous-vide meals served in first class, which most of us will never experience. I’m talking about the meals—or, more accurately, the snack collections—sold in economy, which have gotten so good that you’re often better off just buying food on the airplane than grabbing a bite in the terminal before you board. I’m thinking specifically of one type of airborne food: the reasonably healthy, vegetarian, vaguely Mediterranean snack box. On Delta, it’s known as the Eats Tapas box. On United, it’s the Tapas Snackbox. On JetBlue, it’s the Pump Up box, which is worth the dignity you sacrifice by uttering the name out loud. The individually wrapped, shelf-stable contents of each box vary, but the core is pretty much the same at each airline: hummus, crackers, olives, maybe some nuts. Delta’s box supplements this foundation with a pepper and artichoke dip. United one-ups Delta with a red pepper dip and a Parmesan cheese spread. JetBlue offers a bag of crunchy roasted fava beans that I pine for every time I stare down the sad inventory of the Slate office vending machine. Each airline tops off the box with something sweet but reasonably wholesome: dark chocolate, dried apricots, miniature lemon cookies. These snack combos are ideal for midflight noshing. As the Atlantic’s Julie Beck explained last year, the low air pressure and low humidity in an airplane cabin interfere with your sense of taste, making it harder to detect low levels of certain flavors. When food tastes blander than usual, variety and contrast are all the more important. Red pepper dip might taste insipid if you were eating it on a plane by itself, but alongside salty olives, its nuanced sweetness begins to emerge. But possibly better than the variety of flavors in a tapas snack box is the variety of textures. Since flying turns flavor intensity down a few notches, the creaminess of hummus, juiciness of olives, and crispiness of crackers become all the more important—and with a new texture in each miniature package, you’re unlikely to get bored. If you couldn’t tell already, I love these snack boxes. They feel like a treat, but they don’t set me up for a blood-sugar crash. They are literally the only aspect of the flying experience that does not make me feel gross, greasy, and in need of a shower. How did they happen? The first snack boxes offered in flight looked too much like the contents of the Slate office vending machine: potato chips, jerky, popcorn, Oreos, that sort of thing. Surveys, customer feedback, and focus groups alerted airlines that not everyone wants to spend flights eating the kind of junk food served at middle-school birthday parties. United launched its tapas box in 2010, and Delta followed suit in 2013. Both were a hit; building on the success of the Eats Tapas box, Delta expanded the healthy section of their menu, which now features quinoa wraps and fresh fruit packaged by Luvo. To be fair, though the food itself is good, literally everything else about eating a tapas box on an airplane is terrible. It’s difficult to open the tiny packages without spilling their contents onto either yourself or your neighbor, who is most likely squished against you. Tapas boxes produce tons of packaging waste, which piles up on your tray table like a teetering miniature landfill as you move from one snack to the next. (An alternative strategy is to take all the packages out of the box at the outset and use the box to store your empty packages, but then you have to put all the food on your lap. Who wants food on her lap?) And as much as I like eating the contents of Delta’s Eats Tapas box, I do not like paying $8.99 for it, which seems a little steep for the quantity of food served. Especially when you compare it to the airline food of yesteryear, which, though junky, was free. Then again, high prices, a lack of personal space, environmental destruction, filth and degradation and despair—these indignities have been the cost of flying for some time now. Luckily, horrible food is no longer on the list.